Studying evolutionarily primitive organisms with simpler genomes can provide information about the core genetic machinery required for any biological process, including hormone production and perception. In this chapter, we present findings on strigolactone biology based on work with two model byrophytes, the moss Physcomitrella patens and the liverwort Marchantia polymorpha. 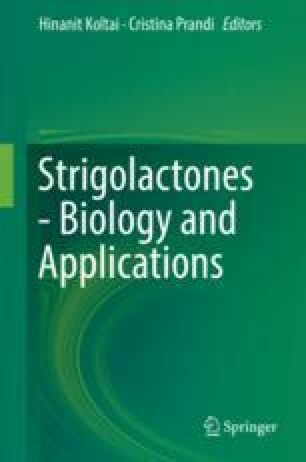 We summarise the existing knowledge of strigolactone biosynthesis in primitive plants, and discuss the role of strigolactones in regulating growth in response to competition from neighbouring plants. We then turn to strigolactone perception and signal transduction, with a focus on the diversity among putative strigolactone receptors in the KAI2/DWARF14 family of α/β-hydrolases. We speculate on the “original” role for strigolactones for early land plants as a rhizosphere signal, before they were adopted as hormones to regulate development. Finally, we summarise discoveries that explain how strigolactones released by plant roots came to be exploited as germination signals by root-parasitic weeds. an informal, paraphyletic group of non-vascular land plants that includes the liverworts, mosses, and hornworts. all terrestrial plants (including those that are secondarily aquatic), a group that emerged within the streptophytes. a gene copy related by descent to another gene copy. Such a relationship is inferred on the basis of sequence similarity. A gene may have homologues within a species or between species or both. Homologues may be orthologues or paralogues. one of the earliest groups of tracheophytes that have microphyllous leaves (small leaves with a single vein). the true ferns with megaphyllous leaves (large leaves with multiple, branched veins). after gene duplication to produce two paralogues, an evolutionary process whereby one paralogue undergoes mutation to create a new function that was not present in the ancestral gene, allowing the second gene copy to retain the original function. In contrast with subfunctionalisation. a gene copy that is separated from related sequence by a speciation event. That is, a gene in species A is more closely related to a gene in species B than it is to another gene in species A. The two orthologues arose from a gene duplication event that predated the speciation of A and B. Orthologues often have similar functions in both species. a gene copy that is not separated from a related sequence by a speciation event. That is, two genes in species A are more closely related to one another than they are to similar sequences in species B. Paralogues arise through a gene duplication event that happened recently within one or both species A and B but after they speciated. Paralogues may indicate that there is functional redundancy or, given enough evolutionary time and selection pressure, functional specialisation. also known as spermatophytes. Plants that bear seeds, namely, angiosperms (flowering plants) and gymnosperms (conifers and allies). the collection of all land plants and the immediate sister group to land plants, namely, the charophyte algae. after gene duplication, an evolutionary process whereby each paralogue adopts a different function from each other, when both functions were previously performed by the single ancestral gene. Thus, each paralogue has now become specialised in function from a more generalist ancestor. vascular plants, which conduct water from the roots along vascular strands or tracheids.